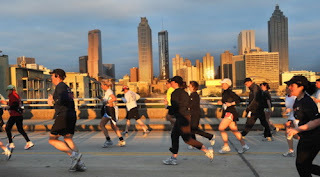 Let me start by wishing everybody that is running the Publix Georgia Marathon or Half Marathon tomorrow good luck. And to prove that I am not a Marathon Snob, good luck to everyone else running any other marathon, half marathon, 10k, 5k, 1 mile, training run, walking the dog, or any other activity that gets you moving. It is not important what event you run, or even that you run an event, what is important is to get active and get moving! Tomorrow is a big day for many people. They have been working so hard for months, and maybe even years to work up to this day. 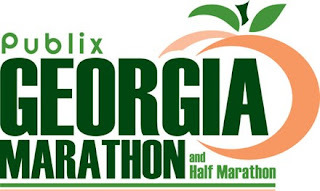 Yesterday while I was working the Packet Pickup at the Publix Georgia Marathon Expo I can't tell you how many people mentioned that this was their first marathon. Many others mentioned how much work had gone into this weekend and how excited they were to see it all come tor fruition. There were also many like me that were a little discouraged because for one reason or another they were having to drop the the half marathon. People have traveled from all over the place to run this race this weekend and it was very cool to see how many different shapes, sizes, and ages were picking up their 26.2 numbers. I overheard someone say I can't run a marathon, look at my body. I had to quickly interrupt the conversation and tell her to walk around and look at others that were running this marathon a little bit. There are so many different people at different places in life that take the time, energy, and dedication to what so many others seem to think is an impossible task and that to me is so very inspiring. 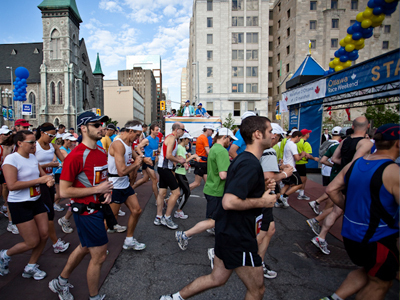 Sure a marathon is not easy, but neither is life. 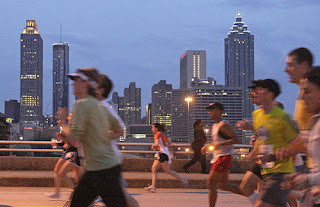 Running a marathon takes work, but it is something that is obtainable if you put your mind to it. I don't have any plans for tomorrow, and in fact still don't know where I am going and what time I need to be there. My race goals are still finish and enjoy (injury free). I have not been preparing much differently than I do for a morning long run, but have been hydrating well all day which I have sometimes neglected to do before some recent long runs. My Favorite Non-Running Partner has been thinking about me and without me asking is currently cooking me some pasta and salad for dinner. I am not considering it a carbo-loading event.... just a very yummy dinner. As far as pace, I am not planning on any pace specifically, but would like to run around a 9 minute pace. That would be a little faster than my long runs, and right at the pace I ran my last marathon at. I know this is doable, but it all depends on how my thigh feels. If not, I am completely happy with any pace. My last two 13.1's were done at ~8:00 and ~8:30 pace but I was obviously in much better shape and mostly injury free at those times. I have mixed feelings about tomorrow. I actually had a twinge of a thought yesterday about being stupid and doing the full 26.2 distance. I had just found out that they are not dropping people to the 13.1 officially, but rather telling the ones that want to drop to just run the half marathon on race day. I scared myself that I would even be considering this at this point, so if you see me tomorrow make sure I make the right turn when the time comes..... even if you have to tackle me! Well, I am off to eat some yummy pasta and then will probably sit down and figure out where I am going tomorrow and what I will wear. Maybe I will even try to get to bed a little early because 5 am will probably come very early! 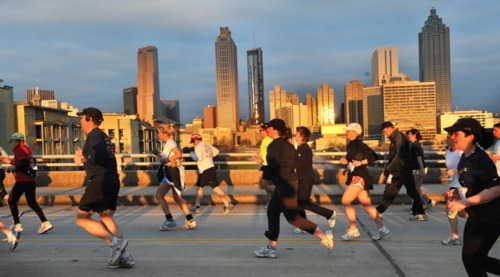 Are you running the Georgia Marathon or Half Marathon tomorrow? Let me know so I can be on the lookout for you. If you are running the full give my red head daughters a high five at the mile 18 water stop! What about other marathons or races? Let us know so we can wish you good luck!